Fossils of four new cetacean species have been discovered at a road construction site in California. 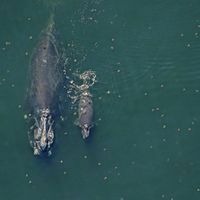 A road-widening project has unearthed four new baleen whales species in Southern California’s Laguna Canyon. The fossil specimens, at 17 to 19 million years old, are the most recently evolved toothed baleen whales yet discovered, reported ScienceNOW. Meredith Rivin, a paleontologist at the Cooper Archaeological and Paleontological Center in Fullerton, California, announced the discovery on Sunday (February 17) at the annual meeting of the American Association for the Advancement of Science in Boston. She said that the fossils were members of the same cetacean suborder, called the mysticetes, that gave rise to extant baleen whale species. Today it’s possible to spot tell the difference between a baleen whale and another cetacean by checking if it has teeth. 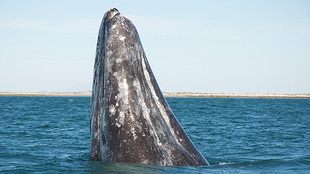 Baleen whales, such as gray whales, blue whales, and humpback whales, feed using comb-like structures in their mouths that filter krill out of the water. 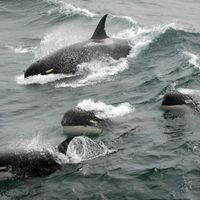 The toothed cetaceans, which include killer whales, sperm whales, and dolphins, are though to have split off from the baleen whales about 35 million years ago. Past findings have shown that soon after that split, mysticetes still had teeth. Even today, some baleen whales develop tooth-like structures early in development, reabsorbing them before they are born. The new fossil discoveries indicate that the mysticetes kept their teeth even longer than scientists had previously thought. One fossil, named Willy, is particularly intriguing. Analyses of his teeth indicate that he could have chomped on sharks, Rivin said. And he’s surprisingly large, she added. 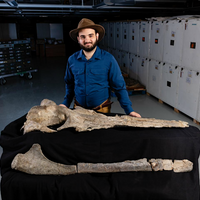 Early baleen whales were thought to have been much smaller creatures and to have attained their famously gargantuan sizes only about 10 million years ago. Rivin is still excavating Willy, but said she plans to publish a paper on at least the other three fossils by the end of the year.